On 23 February, during the Defender of the Fatherland Day (День защитника Отечества Den zashchitnika Otechestva) Russia honors those who are presently serving in the Armed Forces and those who have served in the past. During the era of the Soviet Union, it was called the Red Army Day or the Day of the Soviet Army and Navy (celebrating the day of the first mass draft of the Red Army in Petrograd and Moscow or of the first combat action against the invading German forces). In the former Soviet Union, 1 May was International Workers' Day and was celebrated with huge parades in cities like Moscow. Though the celebrations are low key nowadays, several groups march on that day to discuss the grievances the workers have. Several communist states (Cuba, North Korea and Vietnam) still hold this day as an official occasion with a military parade and columns of weapons and workers. Russia Day (Russian: День России, Den Rossii) is the national holiday of the Russian Federation, celebrated on June 12. It has been celebrated every year since 1992. 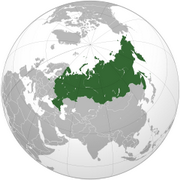 The First Congress of People's Deputies of the Russian Federation adopted the Declaration of State Sovereignty of the Russian Soviet Federative Socialist Republic on June 12, 1990. Unity Day, Day of People’s Unity (or National Unity Day; Russian: День народного единства) was celebrated in Russian Empire until 1917 and in Russia from 2005. Held on November 4 (October 22, Old Style), it commemorates the popular uprising which expelled the Polish-Lithuanian occupation force from Moscow in November 1612, and more generally the end of the Time of Troubles and foreign intervention in Russia in the Polish-Muscovite War (1605–1618). Its name alludes to the idea that all the classes of Russian society willingly united to preserve Russian statehood when its demise seemed inevitable, even though there was neither Tsar nor Patriarch to guide them. In 1613 tsar Mikhail Romanov instituted a holiday named Day of Moscow’s Liberation from Polish Invaders. The holiday, held in October, was abandoned in 1917. November 4 is also the feast day for Our Lady of Kazan, the holy icon which the Russian Orthodox Church probably venerates most.